"The unfolding of Your words gives light." 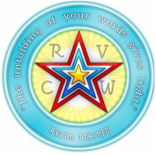 RVCW exists to provide a "caring" Christian system of support, fellowship, encouragement, education and spiritual growth for both aspiring and seasoned writers while upholding biblical truths. Our yearning is to see the lives of our members, the publishing world and the reading public changed and made alive in Christ. engage in active Christian fellowship as we encourage each other in the field of writing. desire to demonstrate excellence, love, and professionalism both inside and outside the writing community. develop or strengthen writing, publishing, and marketing skills through special educational activities, workshops, and critique help. make attendees aware of upcoming local and national writing conferences, resource materials, writers’ competitions, and marketing trends. Meetings are held on the third Thursday of each month, 6:30-8:00 P.M. at Cave Spring United Methodist Church in Roanoke (no meeting is held in December). For meeting details/questions, contact Barbara Baranowski (540) 581-5117 (h), (804) 350-6320 (cell). We would love to have you join us.